Photograph of large Victorian-style home with a fence in front and a car on the side. 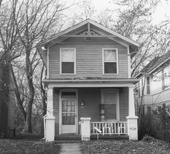 James Clark Hughes was born at 235 Greenwood, Topeka, in 1888. This photograph was taken when he was home on leave to spend Christmas with his family. In 1917 James C. Hughes was Captain of Battery C, 130th Field Artillery, Kansas National Guard. He was stationed at Camp Doniphan, Oklahoma, for field artillery training. Camp Doniphan is adjacent to Fort Sill which is just outside Lawton, Oklahoma. The 130th Field Artillery, Kansas National Guard, trained at both in 1917 and 1918 as part of the 35th Division. The 35th Division was constituted in 1917 as one of the 17 National Guard divisions authorized for service in World War I. The division was organized from the National Guard of Kansas and Missouri. The 35th included three machinegun battalions, three field artillery regiments, four infantry regiments, one engineer regiment and one signal battalion with a total strength of 26,373. A full biography of James Clark Hughes is available at the link below to Kansapedia. James Clark and Mabel Renwick Hughes home at 418 Taylor, Topeka. Their son, James Renwick Hughes, poses on the running board of James White Frierson Hughes' car. Someone is in the driver's seat. In 1917 James C. Hughes was Captain of Battery C, 130th Field Artillery, Kansas National Guard. He was stationed at Camp Doniphan, Oklahoma, for field artillery training. Camp Doniphan is adjacent to Fort Sill which is just outside Lawton, Oklahoma. The 130th Field Artillery, Kansas National Guard, trained at both in 1917 and 1918 as part of the 35th Division. The 35th Division was constituted in 1917 as one of the 17 National Guard divisions authorized for service in World War I. The division was organized from the National Guard of Kansas and Missouri. The 35th included three machinegun battalions, three field artillery regiments, four infantry regiments, one engineer regiment and one signal battalion with a total strength of 26,373. A full biography of James Clark Hughes is available at the link below to Kansapedia. This large three-story wood-framed house is located at 512 East Sherman in the Houston Whiteside Historic District in Hutchinson, Kansas. The District was added to the National Register of Historic Places in 2004. This is a view of a two story wood-framed house located at 818 South Esplanade in Leavenworth, Kansas. This photograph shows the Cutlers standing on the back porch of their home in Council Grove, Kansas. This photograph shows the A. D. Birch family and friends listening to a radio. Birch lived at 1109 Van Buren in Topeka, Kansas. This is a photograph of A. D. Gise's home probably located at 611 Spruce in Coffeyville, Kansas. A. D. Gise owned the A. D. Gise Motor Company. This is an exterior image of A. J. Anthony's home, one mile west of Dodge City in Ford County, Kansas. This is a postcard of Dr. A. L. Charles' home in Lancaster, Kansas. This photograph shows a view of A. S. Parsons' residence in Finney County, Kansas. In addition to the residence, an outbuilding is visible on the left side of the photo. This photomontage or exaggerated postcard shows an African-American family standing in front of a giant watermelon that resembles a home. It was used as an advertising item for the Palace Clothing Company for a raincoat sale being held in the Arts Building of the Topeka Fair Grounds. The photo content would not be considered "politically correct" by current standards. This is a photograph showing Aaron Lane Lanning and Sarah Emma Preston Lanning standing in front of their house located near Melvern, Kansas. This is a postcard showing Aaron Lane Lanning and Sarah Emma Preston Lanning standing in front of their house near Melvern, Kansas. This is a photograph showing Aaron Lane Lanning standing in front of his house near Melvern, Kansas. He was born in Middlesex, New Jersey, November 3, 1845. Lanning came to Kansas in the summer of 1865 after he was discharged from the Army. He brought his parents and siblings to Mound City, Kansas, and it was here he married Sarah Emma Preston on November 3, 1867. Lanning settled in Melvern where he farmed, served as a township clerk, township trustee, county commissioner superintendent of the Maxon Presbyterian Sunday School, officer on the school board, and post commander of the Grand Army of the Republic. Aaron and Sarah had five children and three of them were living when he died on March 12, 1935. This is a photograph of Abraham Burnett's log cabin located southwest of Topeka, Kansas. A photograph of the Abraham Pratt home near the Solomon River in Studley, Sheridan County, Kansas. Cottonwood Ranch was added to the National Register of Historic Places in 1983.